Even though the weather here in the UK is still not great I have started to collect a few more pieces to add to my spring wardrobe! I've compiled a list of spring staples that I think are staples for this transition period into spring and through into summer! 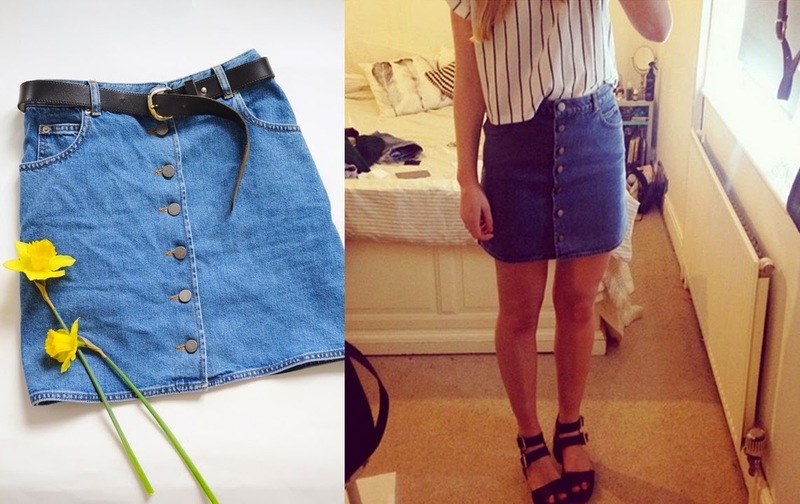 1- Denim - Denim is a huge trend this spring with lots of raw distressed edges , frays and my favourite the button down skirt! I saw this A line button down mini in mid wash blue on ASOS I snapped it up ready for spring. I have worn it a few times already with tights and boots but im excited to style it for the warmer months with crops and chunky sandals. 2- Chunky Sandals - I have quite the collection of chunky sandals these being my most recent and favourite buys, I feel they add a bit of an edge to any outfit I especially love the Glitter Heel on my New look pair! 3- Jewels - When wearing jewellery in spring I love to either layer up little charm style pendants or have one statment large necklace which looks great layered on top of a white tee! 4- Patterned Trousers - I have been buying lots of patterned trousers recently I found New look had such a lovely selection and at a great price, they are super flattering and easy to style as you can just throw on a basic tee, layer a leather jacket and some chunky sandals and you are good to go! 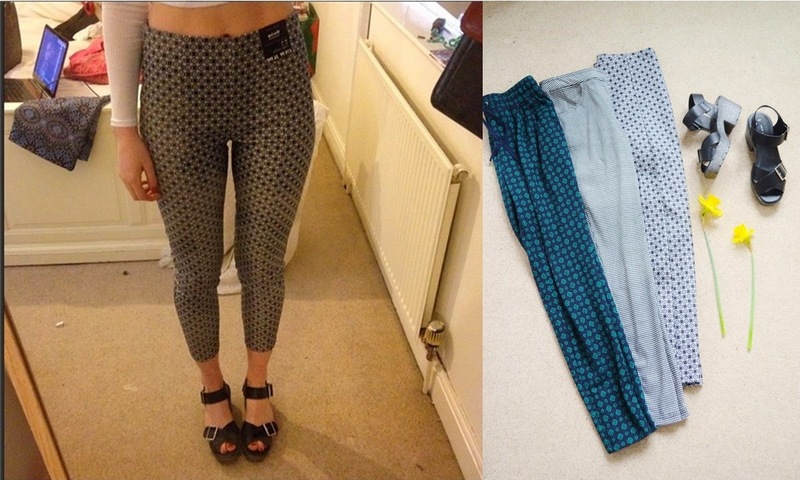 Adding a bit of pattern to my wardrobe after a winter of monochrome basics wont go a miss either. 5- The leather Jacket- I think the leather jacket is really an all year round staple, I've had mine for years and it seems to just get better with age! Its great for spring as its quite light weight and good for layering but also adds a tough edge to any look. 6- The Basic Tee- I feel like I am forever on the hunt for the perfect white tee and FINALLY I think I have found it in the form of a TOPMAN White tee unlike any of the women's white t shirts I own this one isn't see through and doesn't go out of shape due to the heavier weight of fabric used, I picked a few up in a small and like the fit as its slightly oversized. Its also good to have a grey and black and a mix of crops for spring/summer which I usually pick up from H&M as they are super inexpensive! 7- Long Length Cardigans - I have a black, grey and a burgundy lightweight waterfall cardigan which is great for the warmer months as it adds a little warmth but also makes your outfit look really cute! 8- Skinny jeans - Really an all year round staple but the Topshop Joni Jean is my favourite looks great with a crisp white tee and chunky sandals. 9- Cropped jumpers- I still need to keep warm going in to spring so some cute little cropped jumpers are a great buy especially as they are all going into the sale as we move out of winter, I picked up two in H&M recently for £7 each! As I wear a lot of high waists the cropped jumper works really well. 10- T-shirt dresses - I really love the effortless look a t shirt dress gives in the spring/summer teamed with my favourite chunky sandals, lots of jewellery and a vintage bag! they are super versatile and can be layered up or worn on their own. I hope you enjoyed this post :) I am looking forward to wearing more colour/pattern in the warmer months and hoping to have lots more fashion posts for the blog! Comment below with your spring staples! I love everything in this haul. The patterned trousers fit nicely.